Gendarme of course refers to the French policemans hat which is the same as Napoleons classic chapeau. High in the center with a gentle slope that finishes in a crisp point at the corners. I was fortunate to snag this pair at a large outdoor show south of Paris. The competition is fierce at these hugs shows and most chairs have been bought up before I get a shot at them. There are many models that I pass for lack of style, materials used or overall condition. Gendarme are always on the top of our list alongside Mustache and rollback. 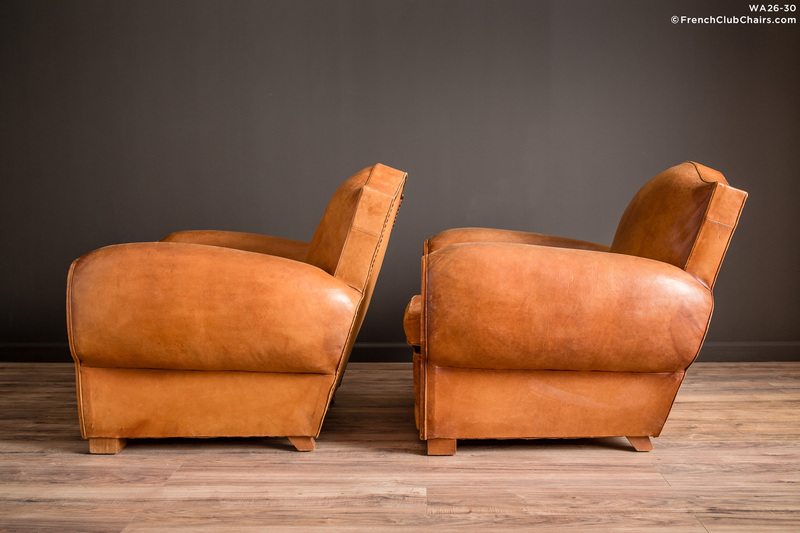 This pair has all its original leather, There are light abrasions on the outer arms, overall , excellent condition with a deep comfortable seat. Circa early 1940s. measurements: depth-39", width-36", height-33", seat depth-23", seat width-18.5", seat height-16"